Oops. I think I skipped this post last month. What can I say? Life gets busy sometimes. I’m working on a couple of art pieces, trying to get more jewelry up on Etsy and I am already starting to help plan next year’s Relay for Life. Woah. It’s definitely time to stop and smell the roses. Here are a few things I’m just loving lately. I was honored to attend the CincyNanny National Nanny Recognition Week VIP Nanny Dinner. Yes. That’s a thing: National Nanny Recognition Week. It was created for all of us in the home childcare field to give each other big high-fives. In the last few years our industry has made it even more exciting. Nanny agencies, groups and associations across the country do all kinds of things to celebrate each other. Our local group here in Cincinnati is called CincyNanny. Its a fantastic group of local nannies who come together online and in person for friendship, networking, nanny nights out, play dates, education, nanny/family pairing and empowerment. We held a VIP Nanny dinner at the National Exemplar in Mariemont to honor each other and talk about some really cool things happening in our own community. I can’t spill all of the beans yet but a couple of those cool things are Nannypalooza and National Nanny Training Day! (I accidentally made this a game of “How many links can I squeeze into one paragraph?”). It was fun to get dressed up (most of us are used to play clothes), go out for a nice dinner and celebrate each other. 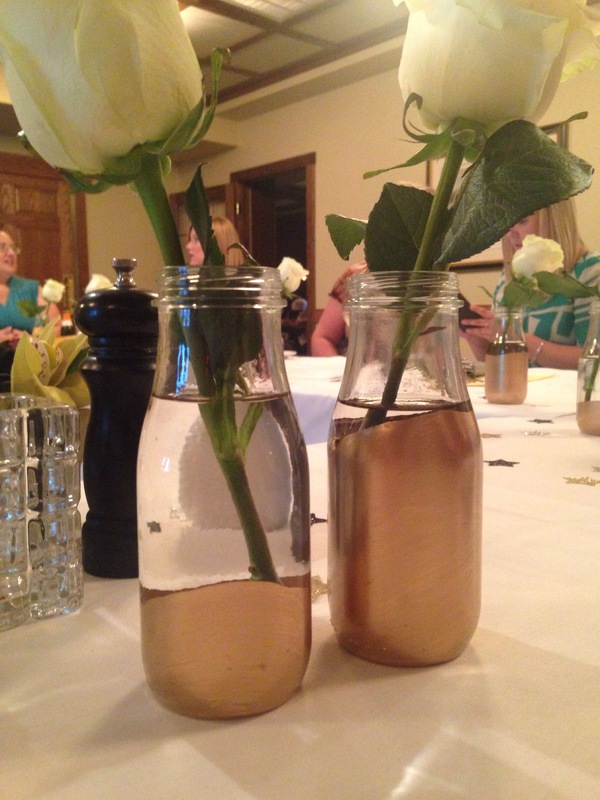 My friend Greta of Project Momma is the brain behind CincyNanny and she created these darling vases from recycled Starbucks bottles and bronze paint to give them the “dipped” look. We each got to take one home with a white rose in it. Super cute! Z recently finished the 50th of 100 reading lessons we have been working on. As a reward he chose to have a sleepover at my house with O. How adorable! I really am the luckiest girl in the world! We had dinner at my parents’ house for my sister’s birthday and Z tagged along. He knows my whole family since we all nanny and have play dates together so he jumped right in. We enjoyed pizza and s’mores before we headed home for our sleepover. 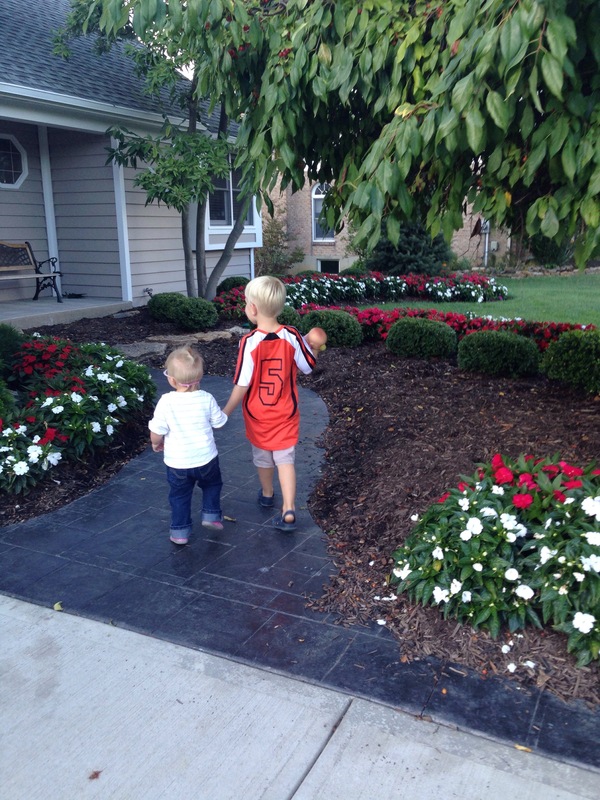 How cute are these two walking hand-in-hand to my parents’ front door? Z even carried O’s baby doll for her! 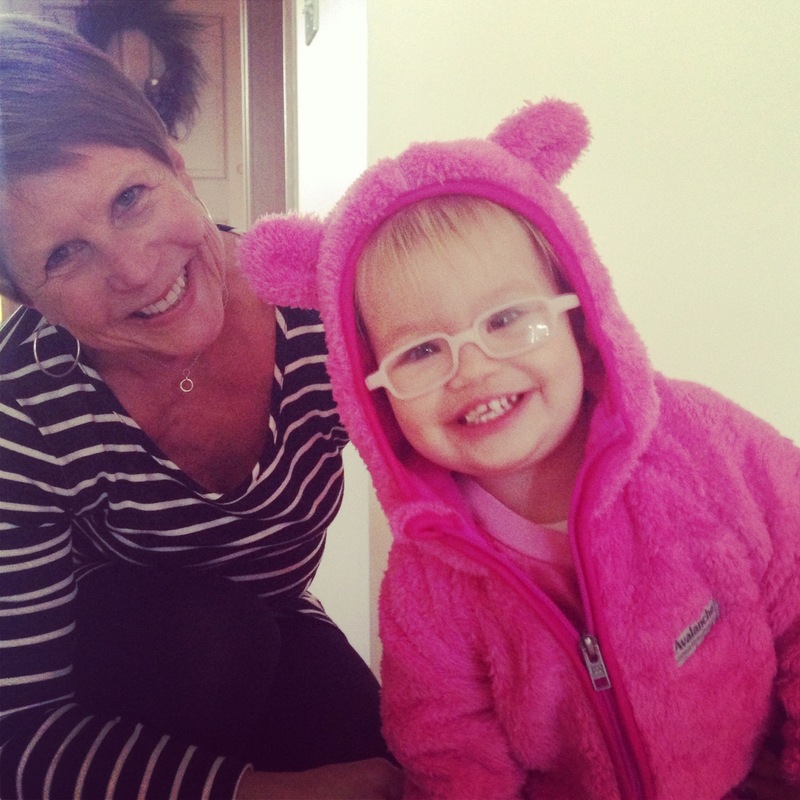 Now that O is wearing glasses we’ve noticed quite a few changes. She’s more interested in lots of things and is far less clumsy. She has mastered stairs (to the point that they are her new favorite play set), is less hesitant on slides and isn’t afraid of leaves (I mean if you were farsighted they would look like a ton of mysterious blobs who move in for attack every time the wind blows). Her life is just so much more clear and it makes us so happy. Check out this awesome art piece! 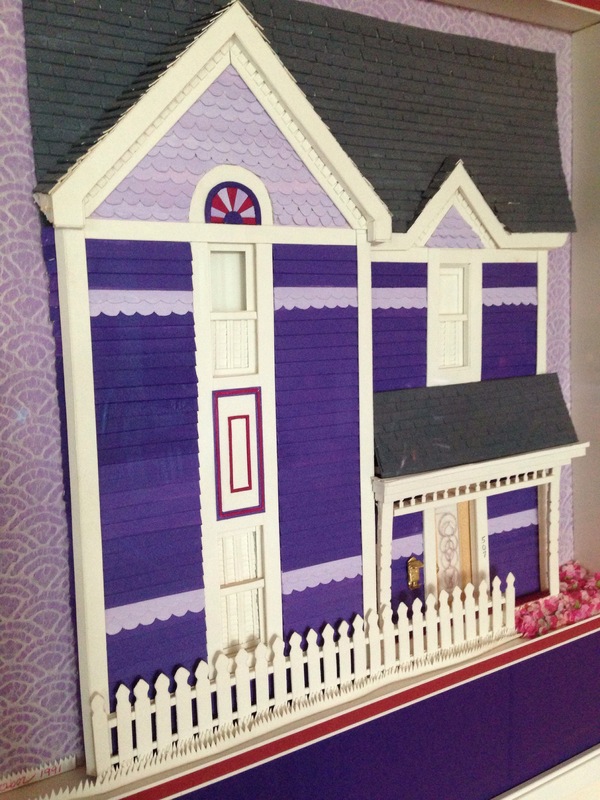 It is a shadow box style replica of the Painted Lady Victorian (Columbia-Tusculum Cincinnati… not San Fran) we lived in when I was a kid. My mom had it made when we lived there. It was packed up for several moves and forgotten in the basement. She recently stumbled upon it and now hangs proudly in the kitchen. I can’t stop admiring it. The intricate details and accuracy are so impressive. It really captured the spirit of the house. O got a new coat! How stinking sweet… Those ears are just awesome. She is obviously excited about it too. It was a gift from “Big Susie” who is on her left. Big Susie is our dear family friend who my sister Susie was named after… thus, the “Big” part. However, neither Susie is actually very big. They are both petite. Little Susie is maybe 5’2″ and likely taller than “Big Susie”. Its just how we’ve always differentiated the two. I love love LOVE this picture. One of O’s new favorite things to do is shout “Mama, Cheese?” and make a face or strike a pose for me to photograph. She almost always tilts her head dramatically and bares a big grin. This kid knows how to fill my days with happiness. I made a new batch of homemade detergent! Finally. I had beens so busy that we actually used store bought junk for a month. 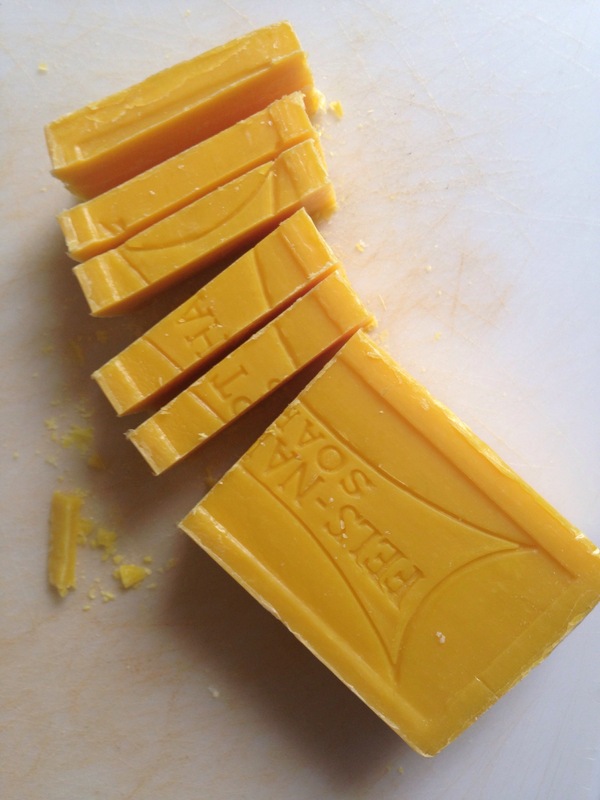 But as I was cubing up my Fels-Naptha bars I couldn’t help but think that they were sort of pretty. Dumb? Maybe but I snapped a pic anyway. The dry-erase board yields some amazing artwork that I wish I could save. Instead I take pictures. 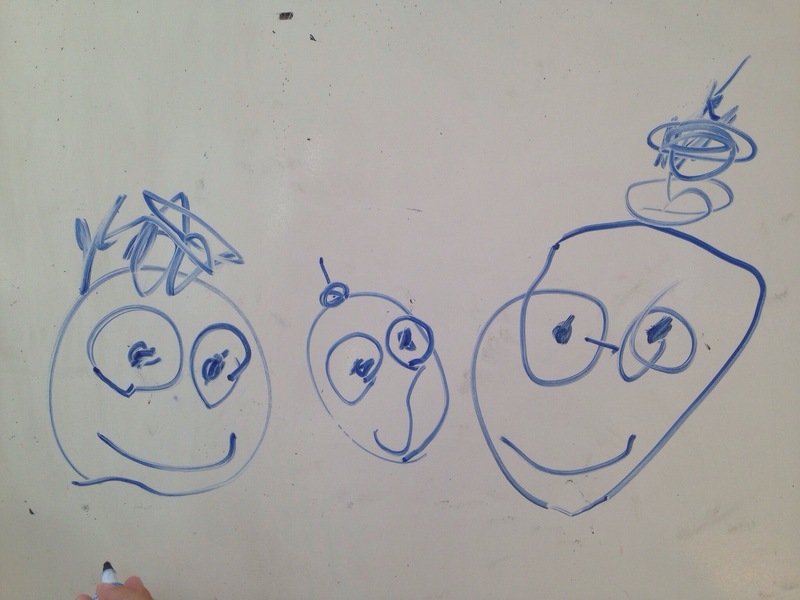 Here Z has illustrated my family . Left to right: Hubby who has his trademark spiky/messy hair thing going. In the middle is O, complete with ponytail on top of her head. Then I have my big ponytail and glasses. Pretty accurate depictions, right? I mean, who needs ears? 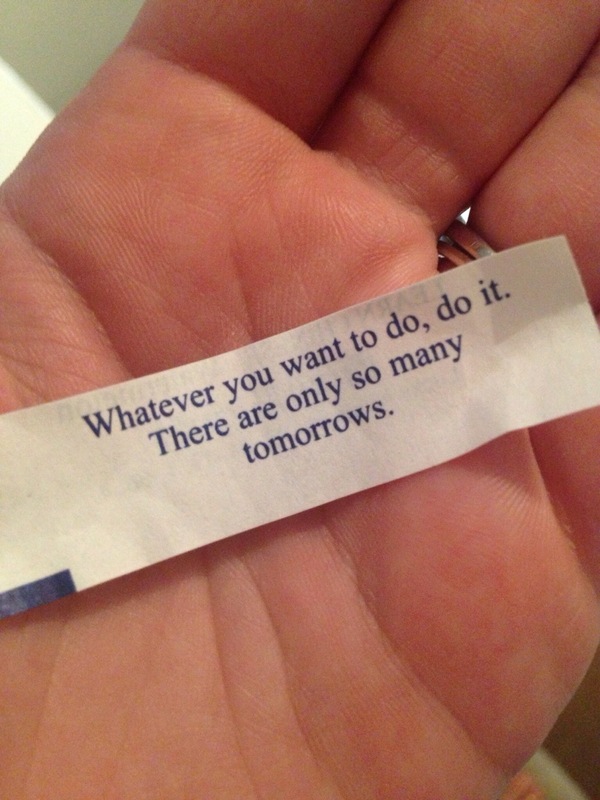 A fortune from Hubby’s Chinese carry-out. He usually lets me open the cookie. 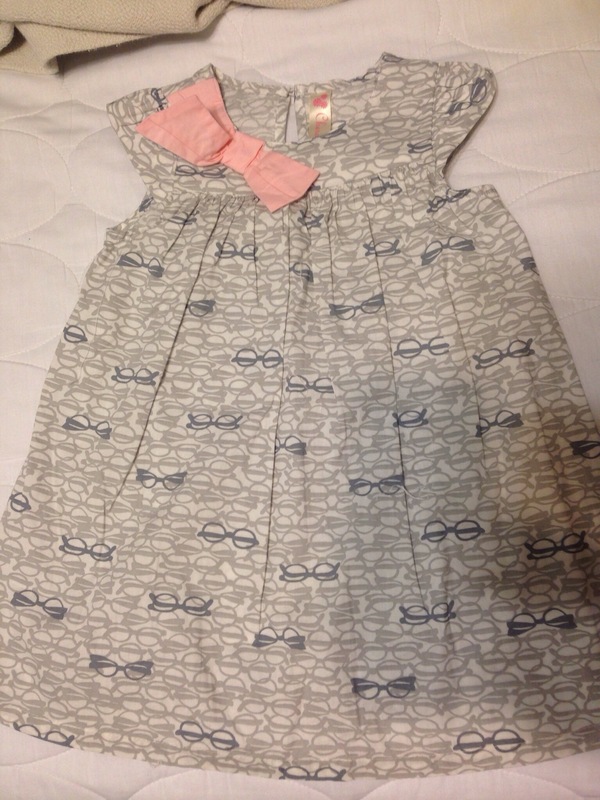 I found this sweet dress at Target right after we went to the Ophthalmologist but before we ordered O’s glasses. I’m so in love. 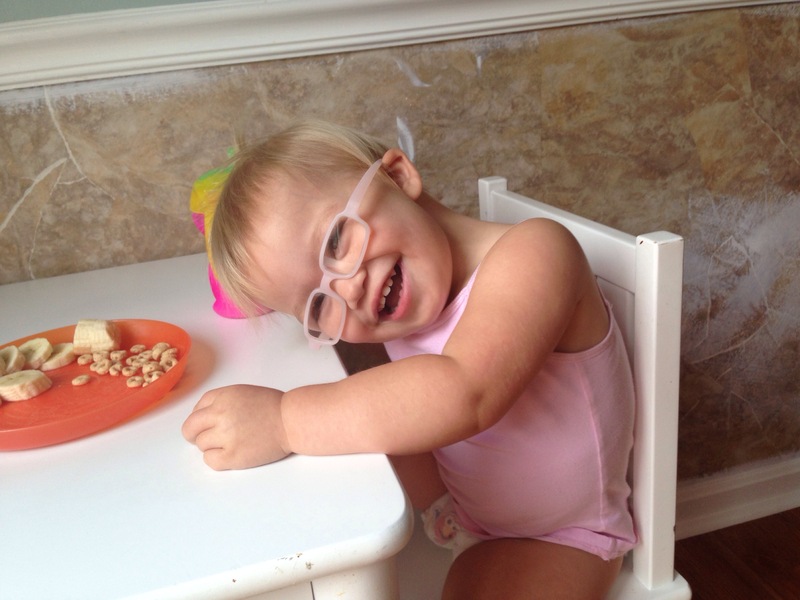 She wore it to Children’s when we tried on frames and made our final choice. Everyone loved it. 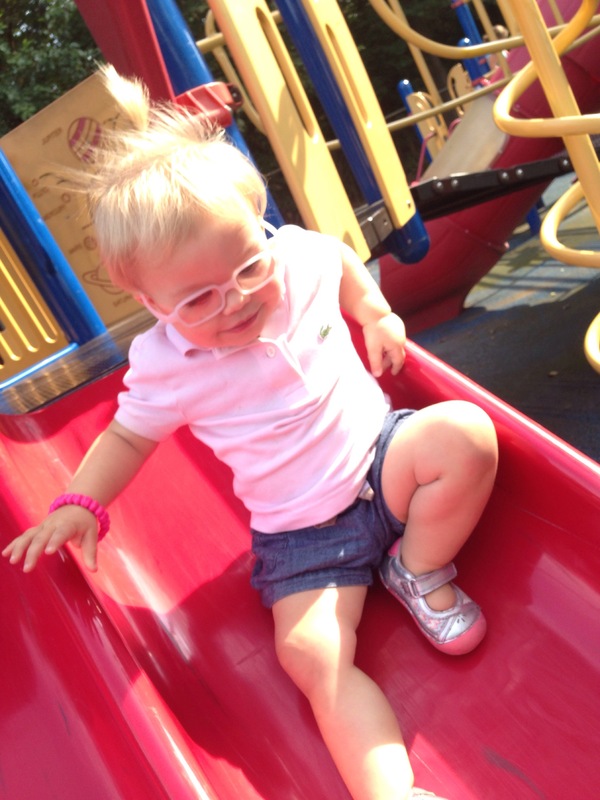 She rocks it occasionally on the playground as well. 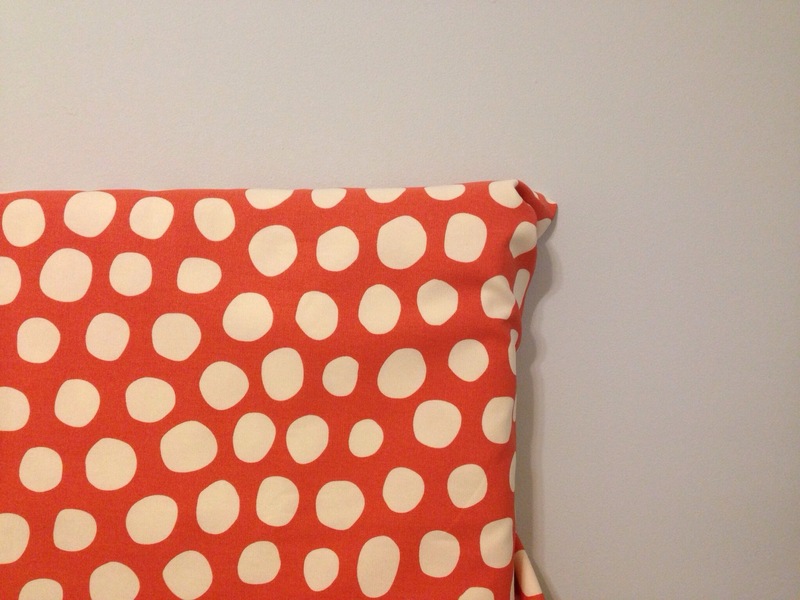 Oh yes, last but not least is this polkadot fabric from Ikea. I fell in love with it and was certain it would make an amazing upholstery fabric for our headboard against the soft blue. But Hubby was strongly against the moment I walked in the door with it saying it was straight out of a Dr. Suess book. Then he said, “Anywhere but the bedroom, please!”… say no more. I have 2 yards of this fabric and I plan on putting it in every room in some form. Except the bedroom. I’ve made it my mission. So what are you loving? Any new discoveries, fashion finds or sweet moments you captured? Do share! 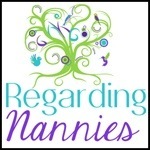 I guest posted on Regarding Nannies blog today. A little piece on how nannies (and parents) can prevent bullying and it was all inspired by the bus stop …but I hope it goes further than that. Click here to read my guest post. Today you can find my article “7 Secrets to a Smooth Summer” at Regarding Nannies! I’ve exposed all those tricks I hide up my sleeve to keep myself (and everyone else ) sane. Earth Day is Monday April 22nd! Over at Regarding Nannies I’ve shared a great recycled craft. We made recycled paper with wildflower seeds embedded in it. Write a message, plant it and wait for wildflowers to grow! Great for Valentines or Mother’s Day cards too. Be sure to check out the post and try it yourself.